Hurricane Michael could bring significant rain and wind to our area Thursday, according to National Hurricane Center projections. For an area still recovering from devastation from Hurricane Florence in mid-September, this is obviously bad news. Michael is predicted to become a major hurricane (with wind speeds in excess of 110 mph) in the Gulf of Mexico by 8 p.m. Tuesday and make landfall near Panama City, Fla., late Wednesday morning. It is predicted to pick up speed but lose strength, becoming a tropical storm somewhere over Georgia on Thursday morning. Its eye, or what is left of it, should pass over our area (Craven County) sometime later Thursday, either as a tropical storm or a post tropical storm. Though by that time nowhere near as powerful as Florence, wind and rain are predicted to be significant, and the cone as projected at 11 a.m. Monday centers squarely on New Bern midday Thursday. Residents with roof damage unrepaired since Florence are particularly vulnerable. Also, soils still soggy from Florence-caused flooding could experience more trees downed by Michael. There is no word about Mumfest, the street festival and concert scheduled for this weekend. Mumfest was rescheduled a month later in 2016 following Hurricane Matthew. Although Michael will have cleared the area by the weekend, it is impossible to predict what damage it will cause and whether that will affect Mumfest planning. New Bern City Staff met Monday morning to discuss all the preparations that are going on ahead of the arrival of Hurricane Florence. Residents should expect widespread power outages and significant flooding in our low-lying areas as well as those near water. Stephens urged residents who live in flood-prone areas to evacuate to family or friends who live outside the path of the storm or, if that is not possible, use shelters once they become available. “Once the storm is affecting our area with significant winds, we will not be going in for rescues until it is safe for our crews to do so,” Stephens said. “It is our intent to begin staffing the EOC (Emergency Operations Center”) at noon on Wednesday and will be there throughout the duration of the storm event. “We will continue to update our city website and social media outlets constantly to provide information for citizens as the storm progresses,” Stephens said. 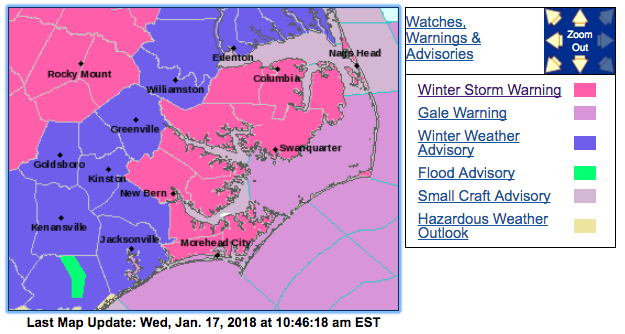 A Winter Storm Warning is in effect for our area in advance of snow predicted for later today. 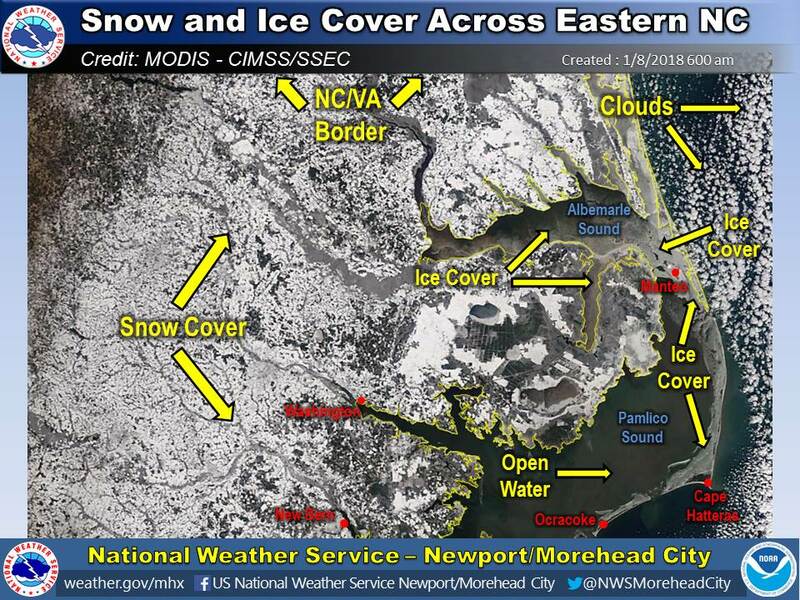 Craven County Schools are releasing early today to get children home before the roads get too bad. to as much as 2 inches possible. snow accumulations of up to two to four inches are expected. * WHERE...Portions of eastern North Carolina. * WHEN...From 7 PM this evening to 6 AM EST Thursday. Things are getting back to normal now that the holidays are behind us. Just kidding. With snow and ice still blanketing the region, it’s like having an extra week off for the Christmas break. Schools have been closed since Jan. 3 and were closed again today. So much of New Bern was shut down last week, it nearly felt like Christmas Day. 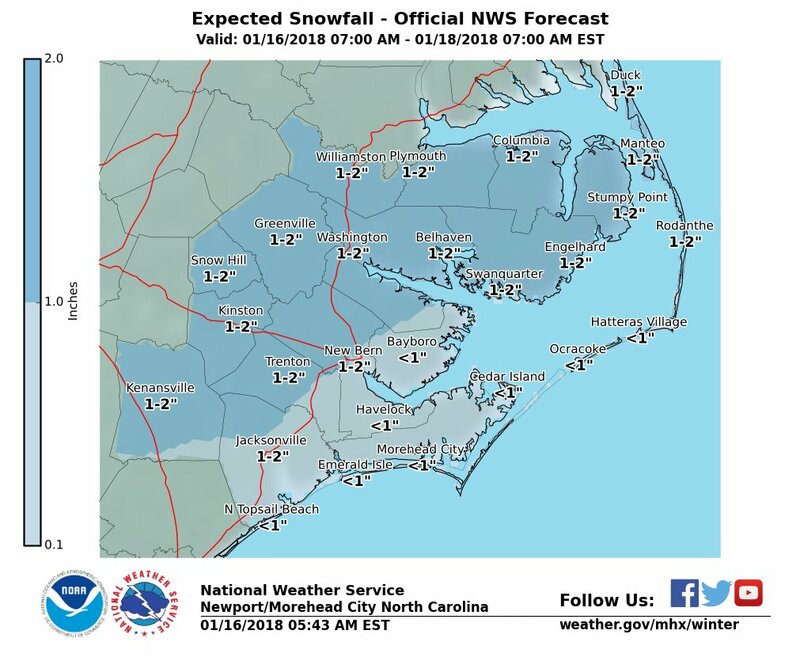 According to the National Weather Service, New Bern officially received 6 inches of snow overnight between Jan. 3 and Jan. 4. Breezy conditions created deep drifts in places, and sub-freezing temperatures kept the snow fresh and froze what was left, making traveling difficult. Still, some locations, including Sonic and Piggly Wiggly, were braving the weather on Jan. 4 and serving needs. Mail delivery was spotty, however, and many businesses reduced hours or didn’t open at all. There was enough snow that sledders had more than enough throughout the weekend and into Monday at the U.S. 70/Country Club Road interchange and at Glenburnie Park. The ice got so bad, at least one U.S. 70 offramp had to be closed due to hardpack ice, and power was temporarily lost to the city’s emergency command center for a time on Thursday. Still, city officials worked overtime and staged equipment on all sides of the rivers to ensure all sections of the city received as much attention as possible. Still, Valerie Noel Perry, a Craven Street resident, was not a fan of the city’s handling of this snow event. Circumstances resulted in her making two visits over the past few days to the CarolinaEast Medical Center Emergency Room, which she described as packed. Crossing the street to Walgreens to fill a prescription, she found it closed. Crosswalks and sidewalks were coated with ice and left untreated. Minor streets were covered with ice for days, and even several major streets were still covered with ice by the weekend. Even during the New Bern Post’s interview with her on Monday, while she was a passenger in a car, there was an ice-related crash right in front of her on Dr. ML King Jr. Boulevard in front of the IHOP restaurant. Frustrated by responses she heard during calls to Mayor Dana Outlaw, City Manager Mark Stephens, and her alderman, Sabrina Bengel, Perry got on the phone with Raleigh, starting with the Governor’s Office and working her way down. She even requested the N.C. National Guard be mobilized. “I’m outraged by what mayor said,” Perry said. First, the phone number listed on the city website was inactive and she had to track down the mayor through his grandson. When she suggested the city lay down sand to improve traction on streets and sidewalks, she said Mayor Outlaw had not heard of such a measure. Perry said she is a retired lawyer from Boston who has lived in New Bern for a year and that she loves New Bern, but does not like how it has responded to this emergency. “Snow and ice shouldn’t be a tragedy,” she said.